If anything I've posted ever offended anyone here, I most sincerely apologize. I know I might come across as unloving sometimes, and it hurts me to think anyone might be hurt by anything I write here. As a sister noted elsewhere, we're family. 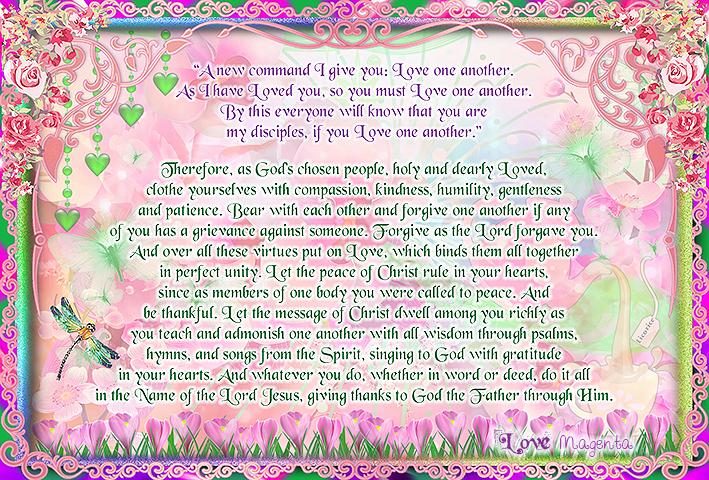 I love you all in Christ, and I pray that hurt feelings will heal, offenses will be forgiven, and all will be edified, in His name, Amen. Have you assembled with people under roofs on Sundays? Yes, and I've assembled with people under the open sky. Is there a point to your question, Uhhhhh? You never gave my donuts. I'm so sorry!!! I donut know what I was thinking! Well, like my friend bobby says, "Donut worry, be happy." Well...........not so sure about the "loving" part but, definitely the "family" part. We're all stuck together "in Christ" - there's just no getting away from each other! The "loving" part - we're all still learning, growing and maturing! It think this is why Paul always said, "Grace and Peace to you" in his greetings in his letters to the brethern (family). LOL! I'm dredging up this old post of mine because I needed to remember how i'm supposed to act. I've had some hard times in the last year, and I allowed personal experience to harden my heart. I have no excuse. Starting with Tourist, I apologize to any and all who might've been hurt or otherwise offended by any of my threads, posts, or responses to anyone else's. Forgive my rudeness. I pray that we all might learn to temper our posts and threads with love-so that we're more than just a bunch of noise. I pray we might find the wisdom to interpret someone else's words in the best light-rather than the worst. I pray that if we can't temper ur responses with love-that we might choose instead to remain silent. It's in the most mighty, and holy, and precious name of our sweet Lord Jesus I pray these things, amen. "Bingo!................ ( learn to LOVE ).....from all walks of life, learning to Love has eluded many. I have learned the process begins with SELF, and shall require daily maintenance of ones own self. the more so, the more one learns to love, and it's not meant to be easy...believe it." You have never offended me Didymous.. I don’t get offended. No worries. Well, brother I think you are an honorable guy. We may not agree at times; I prefer integrity to agreement. I truly enjoy what you share here, and find your experiences to be both unique and fascinating. I especially like hearing about your ethnicity and culture. We all have times of misunderstandings and mishaps, so no worries! Thank you very much for having such a compassionate and tender heart. I'm so sorry about all the issues you've been through this past year -- I missed your posts -- but we're very happy and excited to see you back.